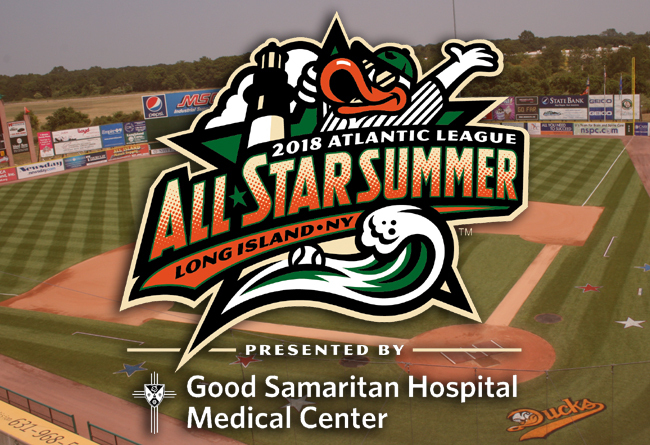 (Central Islip, N.Y., March 13, 2018) – The Long Island Ducks and Good Samaritan Hospital Medical Center today announced a partnership making the hospital the presenting sponsor of the Ducks’ “2018 All-Star Summer”, as well as the Atlantic League’s 21st Annual All-Star Game. The Ducks host the circuit’s midsummer classic on Wednesday, July 11, giving fans the opportunity to see the best players from around the league take the field together for one magical night at the ballpark. As part of the presenting partnership, Good Samaritan’s logo is now incorporated into the Ducks’ season-long logo and slogan, and will be featured in print, signage, promotional items, marketing materials, website, social media, email, blog and other official team platforms throughout the course of the season. The 2018 Long Island Ducks All-Star Summer, presented by Good Samaritan Hospital Medical Center, begins on the road on April 27, with the team’s home opener on Friday, May 4. Tickets for all Ducks home games during the 2018 season, including the Atlantic League All-Star Game, will go on sale Friday, March 23rd during the team’s brand new “Opening Night of Ticket Sales” event. CLICK HERE or call the Ducks ticket office at (631) 940-3825 for more information. Fans will get their first glimpse of the All-Star Summer promotional schedule when it is unveiled at LIDucks.com on Monday, March 19.